The Concordia Stingers women’s hockey team fell to the Université de Montréal Carabins 3-2 in overtime in game one of the Réseau du sport étudiant du Québec (RSEQ) final. Forwards Claudia Dubois and Stéphanie Lalancette each scored a goal for the Stingers. This loss comes after the Stingers defeated the Ottawa Gee-Gees in three games in the first round. The Carabins and Stingers were the top two teams in the RSEQ division all season, finishing first and second respectively. The Stingers are slow starters, and this game was no different. They started the game on their heels, almost overwhelmed by the energy of the Carabins, who were playing in front of a packed CEPSUM Arena. Later in the first, the Stingers had a power play, and the team had the opportunity to apply some pressure of their own after a rough start. On the first face-off in the Carabins’s zone, the Stingers won the face-off back to their defence, who mishandled the puck before sending an attempted shot off the shinpads of Laurie Mercier from the Carabins. With the puck, Mercier took off past the defence, and went on a breakaway against rookie goaltender Alice Philbert. Mercier faked the forehand shot, went to her backhand and roofed the puck over a sprawling Philbert for the short-handed tally. 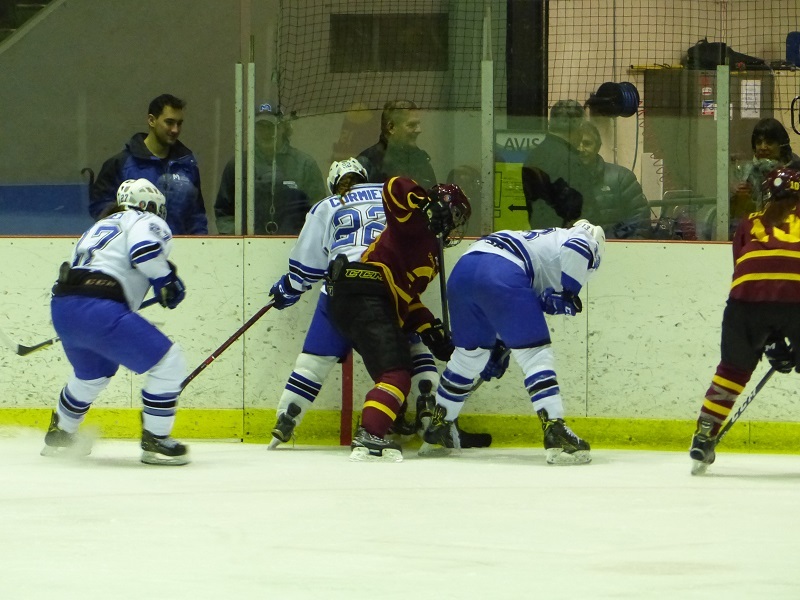 The Carabins spent most of the game in the Stingers’s zone. Photo by Matthew Coyte. The Carabins maintained pressure for the majority of the first period. It wasn’t until near the end of the first that Concordia managed to get any sort of momentum rolling. The Stingers started the third period on the power play, and 30 seconds into the period, Dubois, who led the team in scoring during the regular season, scored to tie the game 1-1 off a rebound from a Lalancette one-timer. The move of the night came in the third period from the Carabins’s Marie-Pier Dubé, who took a cross-ice pass, crossed the Stingers’s blueline, toe dragged around both defenders and somehow managed to poke the puck past Philbert to give Montréal a 2-1 lead. Once again forced to play from behind, the Stingers responded five minutes later. Lalancette took a stretch pass along the right side of the ice and found herself in a one-on-one against the Carabins defender. She moved to the middle of the ice, gripped it and ripped her wrist shot over the glove of the Carabins goalie. Even with the tying goal, Lalancette said her team didn’t do enough to generate chances. After three periods of play, the game was tied at two-a-piece and headed to overtime. Every meeting between the Stingers and Carabins this season has gone to extra time. The Stingers won the first three meetings, and the Carabins won the last two regular-season games. “In overtime against them, we know that it’s not going to be easy,” Lalancette said. The overtime period didn’t quite go the way the Stingers had probably planned. They were barely able to leave their own zone, commiting a number of turnovers that led to quality chances, and forced them to play on the defensive. During that pressure, Carabins forward Alexandra Labelle fired the puck just over the blocker of Philbert for the win. The result was disappointing for the Stingers, but not unsurprising according to Chu, who simply said the team didn’t play their best hockey. Lalancette said the Stingers need to use their speed for game two in the best-of-three series. Game two of the final will take place at the Ed Meagher Arena at Concordia’s Loyola campus on Saturday, March 3 at 3 p.m.
Main photo by Matthew Coyte.